A couple weeks back I attended a Pampered Chef party hosted by a new friend. It was your typical party where we cooked and ate and cooked some more. The party had a theme of soup and slippers, so the name tells you that we had soup for supper! What was great about the party was indeed the soup that we all collectively prepared. Truthfully, I’m somewhat of a fussy eater and as we prepared the soup I kept thinking…there is NO way I’m eating that. But then a party goer just like me fixed a bowl and it looked pretty good, so I too got a bowl of it…a small bowl. I took a bite and immediately when back for a larger serving! Not sure why it is is called “Lazy” Lasgna Soup so I’ve shorted it to Lasgna Soup. I decided that you all absolutely had to at least read/hear about this fabulous light soup so I’m gonna share my version of it. First, you need to remove the sausage casing if you found it in sausage form, I found it(at Publix) with the casing and once without both tasted the same. Crumbling the sausage, add the onion, garlic and salt and pepper to taste. Brown until there is no pink left. 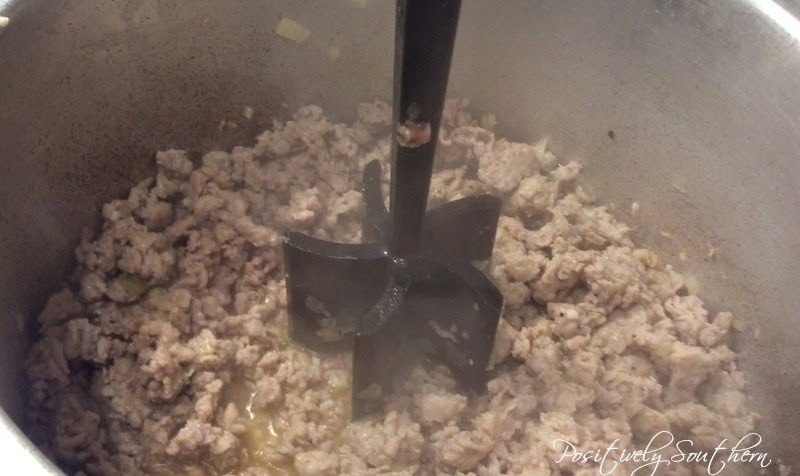 I like my meat chopped up very fine so I use a chopper like this on all ground meats! 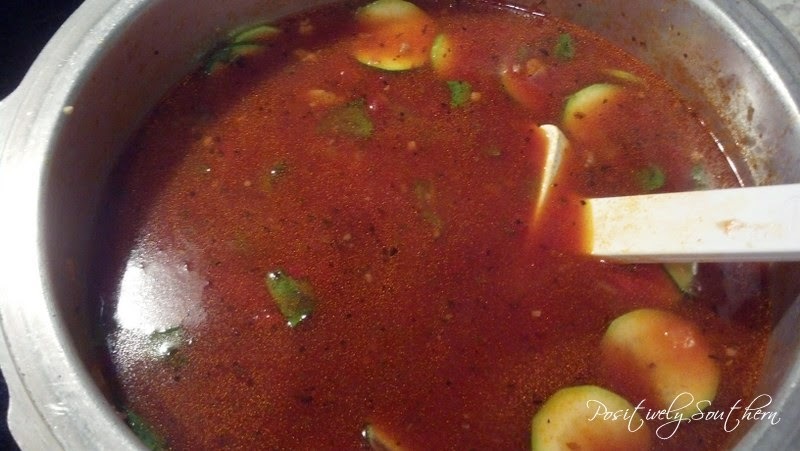 Add the pasta sauce, the zucchini slices, beef broth and the cooked pasta (leave the pasta a little on the under cooked side so it will not be mushy). Let this simmer for maybe 5 minutes and I’d add the pasta at maybe the last 2 minutes of cooking. I over cooked my pasta the first time I made this so I am going to be careful about when I add the pasta next time around! At this point if you are adding fresh basil toss it in. Let it rest for maybe 10 minutes and then serve! I served it with garlic french bread and it was the perfect accompaniment. This looks great! I'd make some tweaks because I don't eat beef, but I would imagine chicken or veggie broth could work, too. 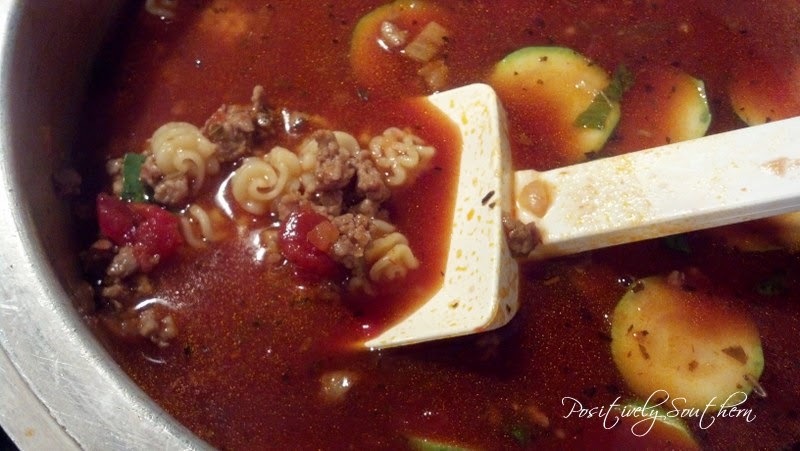 I love that you did this with pasta sauce, though. That's fantastic!